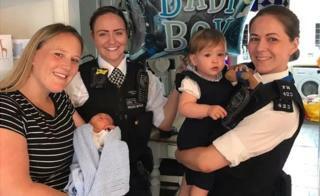 A baby who was unexpectedly born outside a west London police station has been named Bobby by his mother. Rebecca Fox was in labour and being taken to hospital by her mother Sandra on Thursday when she realised her baby was coming sooner than expected. They pulled into Chiswick police station's car park where they were joined by a police staff member and a PC, and Bobby was born in the car. The Met Police said both mother and child are doing well. Staff member Jacky Brosnan said she "heard a lady outside in the car park shouting" so she looked out of the window "and there was another younger woman in the car with her feet on the dashboard". She then rushed downstairs, grabbing PC Holly Foran along the way, and they went out to help. "Within two minutes a baby boy was born," she said. A doctor who happened to be passing checked over Ms Fox and her baby before they were taken to hospital by ambulance.